Let’s get a couple of specifications out of the way. Softphone: An internet phone that can be used on any IoT device—whether in a web browser, desktop app, or mobile app. Webphone: An internet phone that can be used in a web browser only. All webphones are softphones, but not all softphones are webphones. Remember geometry class and learning how all squares are rectangles but not all rectangles are squares? The same idea applies here. Webphones may be difficult to distinguish from your typical web-based audio/visual chat app, but unlike those apps, webphones are able to connect calls to the PSTN (public switched telephone network). True webphones, like the OnSIP app, are functionally indistinguishable from desk phones. Softphones are built for any platform that handles Internet-connected applications. You can use a softphone in a browser or download it to your desktop or to your smartphone. The OnSIP softphone app, in all its forms, is free for all OnSIP customers. Forbes predicts that the workforce will be 50 percent remote in the near future. For people who need to run around to different job sites, or who need to leave work to pick up a child but still have work to do, having a softphone on hand provides that kind of flexibility. Softphones allow you to work from home, leave the office to pick up your kids, or handle anything during the day without worrying about being offline during work hours. You may just be hearing the term “softphone” for the first time, but odds are you’ve already used one or at least known of them. Arguably, the first VoIP softphone was released in 1991 when John Walker released NetFone, now known as Speak Freely, to the public domain. Brian C. Wiles had come close in 1989 when he developed the first softphone using voice over Ethernet. Brian’s story is a familiar one today—he simply wanted to talk to his friends while they played PC games against each other. He and John worked together to turn Speak Freely into the world’s first well-known VoIP softphone. This is where VoIP really hit the mainstream: Brian invented the technology behind Skype in the early aughts. Peer-to-peer calling over the Internet, later with video calling, made Skype a softphone through and through. With the rise of VoIP, interactive video game technology reached new heights as well. If you’ve ever talked to anyone while playing Call of Duty, you can thank gamers from the 1980s for getting the technology going! These days, softphones are just another interface on your device of choice, and the innovation continues. Softphones present a wealth of advantages in the business world: They’re less expensive than traditional desk phones, they keep employees’ personal phone numbers private, and they allow for remote work flexibility. A primary advantage tied to softphones is the cost, no question. For small businesses and startups that need to keep a low overhead, softphones cut out the cost of new handsets and expensive desk phones. IP desk phones tend to run between $50 to $150 each. For companies with employees on the road or regularly working on client sites, softphones cut out the need for multiple unused phones taking up space on desks. But the perks don’t end there. Prefer to work remotely? So do many others these days, and softphones provide that flexibility without sacrificing communication features. In this age of privacy awareness, having a softphone on your personal phone means you won’t have to sacrifice the privacy of your personal number to clients since softphones use your SIP address. It may seem weird to download a phone app to your phone, but having a softphone means your device can tell you if incoming unknown numbers are work related or personal. Essentially, softphones let you maintain a “separation of church and state” type of duality on your personal device. Technology is supposed to make our lives easier, businesses more scalable, and everything more streamlined. But that only works if we update our technology as it evolves. Softphones are the next evolutionary step after desk phones. No longer tied to our desks, able to store our fully functional business phones in our pockets, seconds away from video conferencing—the list goes on. For employees, well, we’re all practically attached to our smartphones these days anyway, so why not turn them into dual personal/work phones? And with the rise of coworking spaces, the traditional concept of having an assigned desk has fallen by the wayside. If you don’t have a set desk space, where do you set up your desk phone? Where do people reach you? Having a softphone means your personal device is a fully functional business phone, so you can take your work with you no matter where you feel like working on any given day. As long as you have a solid Internet connection, softphones keep you connected to the office no matter where you choose to work. Which VoIP Softphone Is the Best? Before OnSIP launched its own softphone, we reviewed third-party softphone apps for our users. Most of these apps charge a licensing fee that is often still significantly lower than a mainstream phone service, but they often include additional fees for access to basic phone functionality like call transfers or voicemail to email. Also, without solidly high-powered headset and speaker capabilities, your softphone call quality may not be as high as that of an HD voice-capable desk phone. After we reviewed those softphone apps, we decided to build our own app in an effort to create an all-inclusive free softphone for our users that could meet every possible business phone need. Because we built it from scratch, we were able to create what we believe is the best softphone app, which includes support for HD voice. Contact Directory: Your softphone should have a contacts list. No ifs, ands, or buts about it. A great way to test out a new softphone is to figure out how easy it is to import existing contacts and create new ones. Extension Dialing: Because business softphones are meant to be as functional as desk phones, they should have the ability to connect to coworkers by extension dialing, especially for joining conferences. Call Transfer: A business-grade softphone should be able to easily transfer calls, whether to another extension, an outside line, or to the same line but a different device. Call Hold: Besides managing multiple calls, your softphone should display how long different calls have been on hold so that you know who to address first. Caller ID: A little bit of a no brainer, because what good is a modern phone app if it doesn’t tell you who is calling your business line? Find out how detailed the app’s caller ID is: just a number, name and number, which type of number, etc. Three-Way Conferencing: Not quite the same as a conference bridge, three-way conferencing just means a third person joins a regular call. Not all softphones have this typical desk phone feature, nor do all browsers support it, so make sure to find out. Presence: It doesn’t need to be fancy, but any good softphone should let you know which coworkers are available or not. Volume Control & Mute: Softphones are great for their mobility, but that also means you might not be in an ideal location to take a call. Good softphones should have volume control and mute options. DTMF (dial pad): Some softphones have eliminated the dial pad as the main interface in favor of a more modern look to their app, but it’s a vital feature for phone menus and conference PINs. 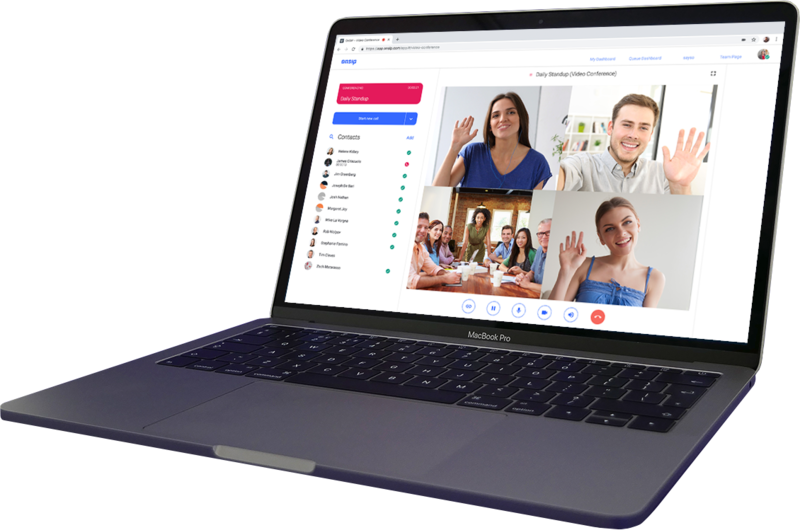 Video Calling: Video calling is wildly important for teams with remote members because it gives a visual presence and makes collaboration easier. Make sure your chosen softphone can enable or disable the video feed at will during a call. When it comes to which softphone platform to use in place of a desk phone, you have three main options: mobile phone app, desktop app, or webphone. In this era of VoIP, virtually all platforms should have the same features and functionality, so the choice really comes down to a personal preference or a matter of convenience. OnSIP employees all use OnSIP’s VoIP service, so we made sure to build a softphone from the ground up and not miss a thing. Not limited to VoIP contacts: On iOS devices, you can choose to call contacts from your phone through the OnSIP app as well as through the standard phone app. Favorites: Put your most common contacts on a favorites list that includes real-time presence. Device transfer: You can easily transfer calls between devices. Picked up a call while grabbing lunch? Transfer it to your desktop app and headset when you’re back in the office. Think back to the early days of Skype, when landlines still reigned supreme. Would you rather have to pick up the handset that wires you to your desk or click on a name in a desktop app? Which one has the clearer interface and even allows you to video chat with the person on the other end of the line? Desktop softphones are like Skype in this situation but with business-grade phone features, collaboration capabilities, and queue supervision tools. Using a web browser softphone, also known as a webphone, has its perks over desk phones as well. The OnSIP browser app functions much like its desktop counterpart but presents a robust mix of the desktop app’s interface and the mobile app’s flexibility: As long as you have your login handy, you can sign into the webphone from any device. Smartphone battery life leaves something to be desired these days, so knowing you can borrow a friend’s device or use a public computer is a comforting fallback. Fortunately, there’s no need to choose among softphones. In fact, you can interchangeably use all three. OnSIP softphones allow you to transfer calls between devices, so going from your cell phone back to your desktop app is easier than ignoring Apple update notifications in the top corner of your screen. Say you get a call while out grabbing lunch. You can answer on your mobile with headphones, then as soon as you’re back to your desk, you can switch over to another version of the app and your headset. Our sales reps are constantly switching among softphone apps and love the flexibility. Learn More About the OnSIP App's Features!